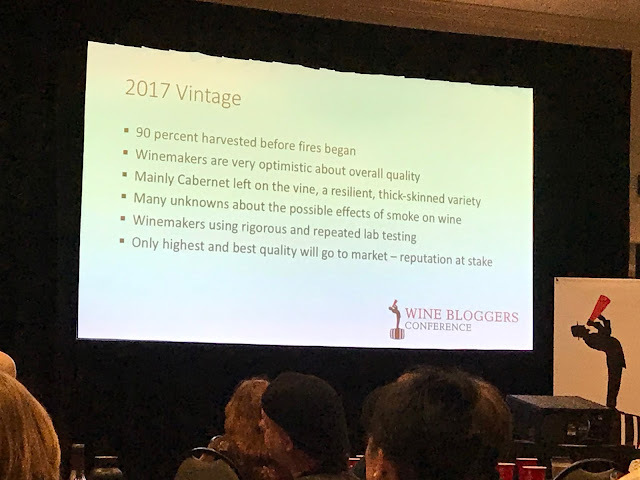 I recently had the opportunity to attend my first Wine Bloggers Conference. (Well, actually it’s been a little over a month, but life has been crazy times around here for various reasons, which is why you haven’t heard from me in a while. ) To be honest, this was my first blogger conference of any kind. I was also lucky enough to receive a scholarship to attend. 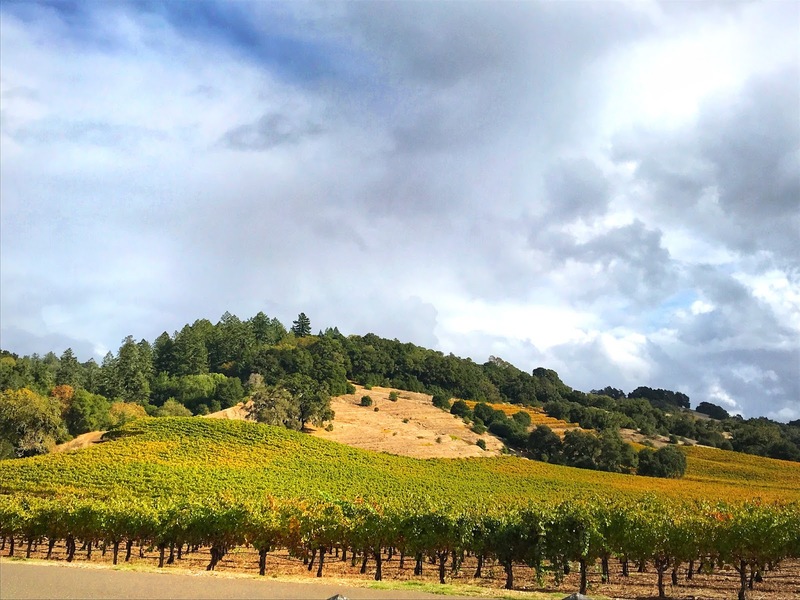 I didn’t really have to travel far–just a little ways up the road to Santa Rosa. Nonetheless, the scholarship made attending a lot easier! It was such a good time and I learned so much. It also gave me so much to think about in terms of how to improve this site, as well as NibblingGypsy.com. 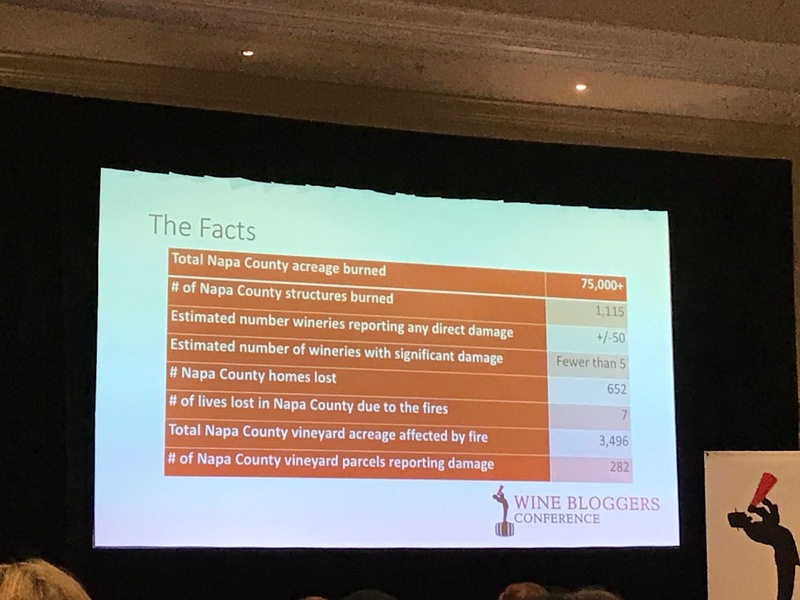 As you can probably imagine, there was also A LOT of wine! And there was also some eating. Since this site is all about the pairings, I thought I’d share a few of my favorite love matches from the weekend. I joined in on an excursion to Hanna Winery at their Alexander Valley tasting room. (The view at the top is also of their vineyards.) 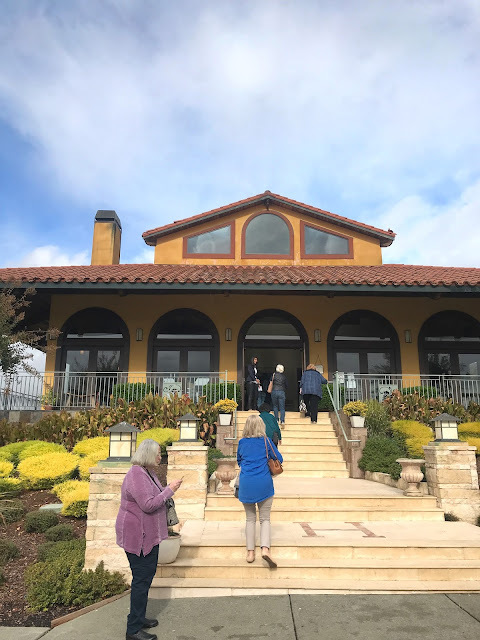 The visit was lead by president and owner Christine Hanna and winemaker Jeff Hincliffe. 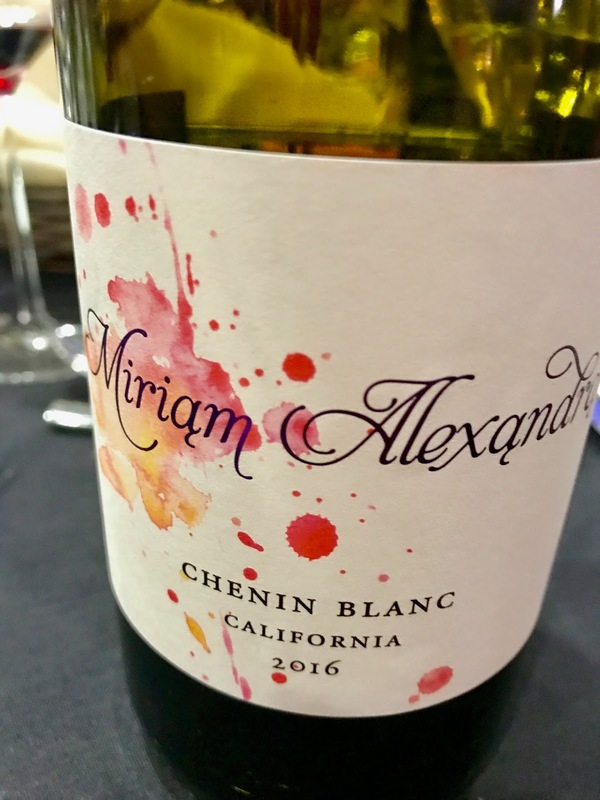 The winery focuses predominantly on Bordeaux varietals, but as Jeff put it, they like exploring the “corners of the Bordeaux box.” So in addition to the usual suspects like Cabernet and Merlot, you’ll also find some of the more neglected members of the family (at least in California) like Malbec. As part of the visit, was also had a beautifully paired lunch prepared by chef chef Heidi West. 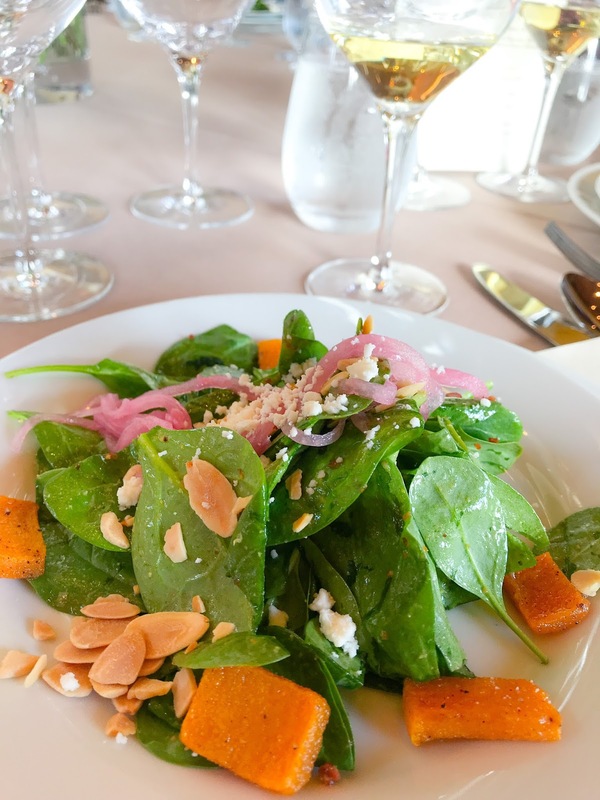 The whole lunch was really delicious, but I think my favorite pairing was the Hanna Russian River Chardonnay 2015 matched up a Baby Spinach Salad with Roasted Butternut Squash, Toasted Sliced Almonds, Pickled Red Onion and Warm Bacon Dressing. 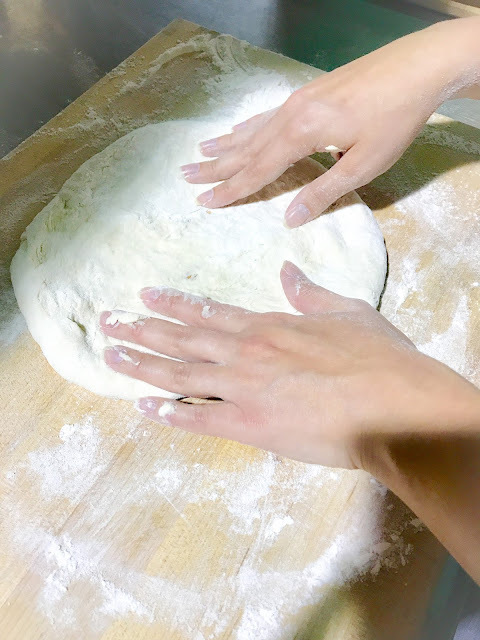 Now, I know oaked Chardonnay often gets a bad wrap in some circles these days, but there are some dishes that it just complements sooooo well! Roasted chicken with root veggies, shellfish in buttery sauces, nutty flavors . . . all are amazing with Chards with a little bit of oak on them. For me the key is that they have to be in balance. If the wine is going to wear all that oak well, it’s going to need a plenty of freshness to carry it off. 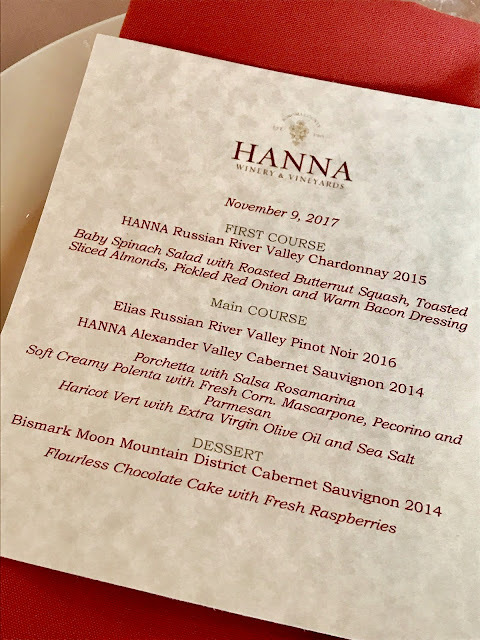 The Hanna Russian River Valley Chardonnay 2015 (listed on their site at $29) hit that balance nicely. It had a mixture of ripe tropical pineapple notes and nectarines, alongside the fresh crispy green apples and a fresh lemons. It was buttery and there were baking spices galore, but it had plenty of brightness to lift it all up. Christine and Jeff mentioned that they let the Chardonnay wines go through malolactic fermentation on their own (rather than inducing it to get started), and this allows them to get the creamy notes, without turning into full on butter popcorn flavor, and while still retaining acidity. It was just magic with the salad. 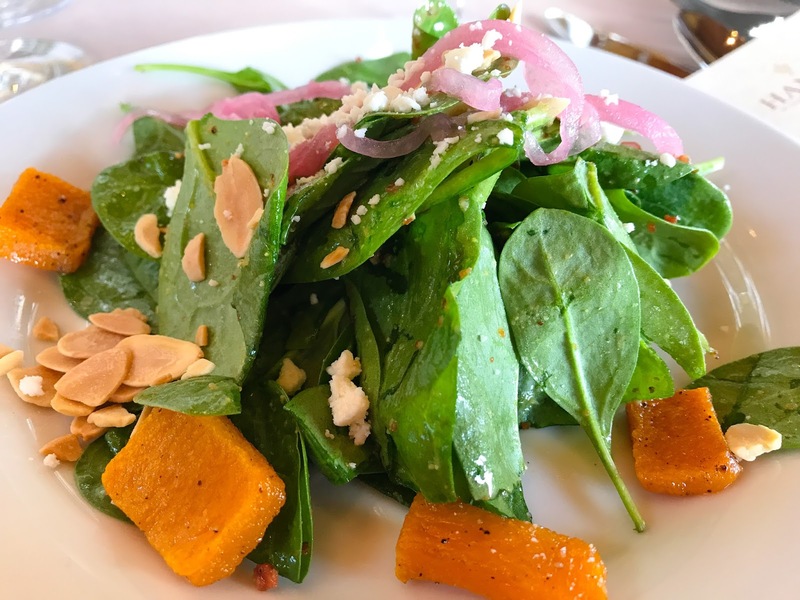 It amplified the bacon dressing and the nuttiness of the almonds, and worked really well with the roasted butternut squash and the cheese. A pleasant bitterness in the wine also came out with the greens. It also matched the weight of all the rich ingredients beautifully, while still maintaining the brightness. One delicious pairings! 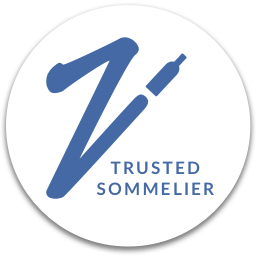 I’m planning to revisit one of their wines early next year, so stay tuned! On the following evening I joined in on a small dinner hosted at Shone Farms. Shone Farms is a part of Santa Rosa Junior College’s Agriculture/Natural Resources Department. It’s 365 acres and provides students with opportunities to get hands-on training. The evening was really chill and fun. 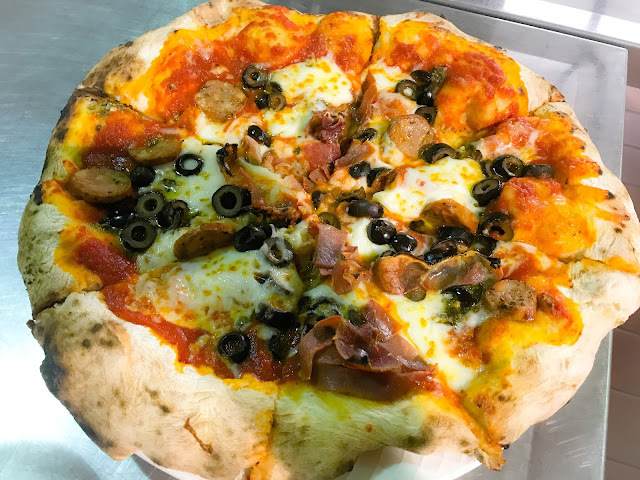 We tossed our own pizzas which were then baked in the school’s wood-fire oven. 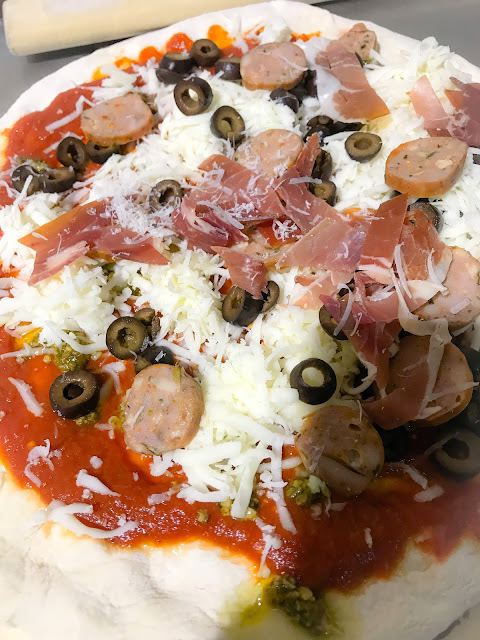 I ended up making my pizza way, way too big. . . no regrets whatsoever. Several Sonoma winemakers were there as well and of course it was a lot of fun to try all the wonderful wines with the pizzas and a selection of salads that were provided. I meant to pay attention to which wine I liked best with the pizza, however, I was having too much fun chatting with some of the conference organizers (be sure to check out Thea Dwelle's Luscious Lushes site), as well as writer and professor Deborah Parker Wong, and the team members and winemakers from Ramey Wine and Sidebar Cellars, and Blue Farm Wines. Ramey is a very well regarded winery in Healdsburg working predominantly with Chardonnay, Pinot Noir, and Cabernet Sauvignon. 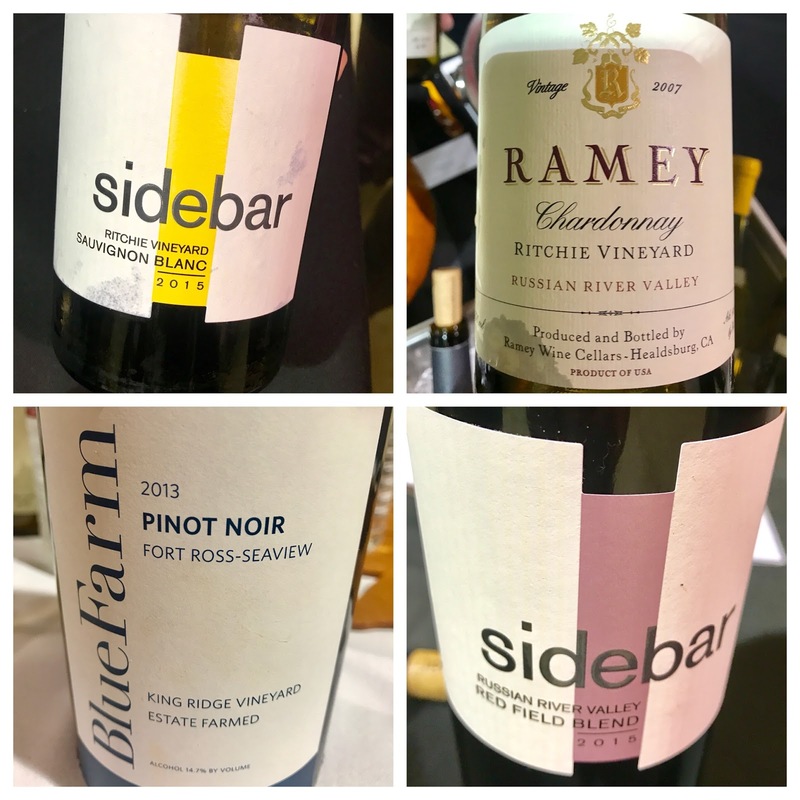 Sidebar is their second label where they play with other varieties and make fun, bright wines meant to be drunk young. Blue Farm is the project of Anne Moller – Racke who started growing Pinot Noir in back of her Sonoma farmhouse. She then help her friend Timothy Mott start growing vines, and the two eventually teamed on expanding Blue Farm. Anne is also the president and winegrower at Donum Estate. Her Pinots were really beautiful. A lovely night all around! One last quickie pairing. On the final night of the conference, there is a final dinner. 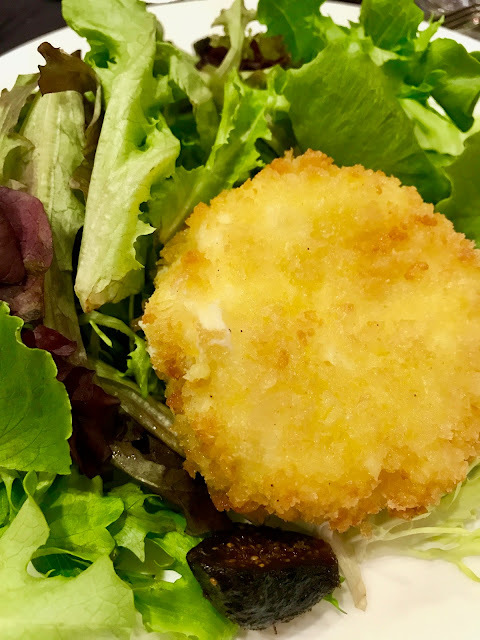 Nothing really fancy going on, but I did like one pairing in particular–a simple goat encrusted goat cheese salad with the Miriam Alexandra Chenin Blanc California 2016. A mix of crispy acidity and stone fruits matched up nicely with creamy, tangy goat cheese. There’s a lot of girl power amongst these wineries. It wasn’t my intention to spotlight wineries with a strong female presence, but just happened to notice the undercurrent, so go ladies! The conference was held in Santa Rosa, which might have you wondering about the status of the area after the fires. We also had Thanksgiving in Santa Rosa and were also up there recently to see friends, so we’ve had a chance to see a little bit. While signs of the fires are definitely visible, it should by no means be deterrent to visiting. The effects of the fire look more like a patchwork rather than something all consuming. 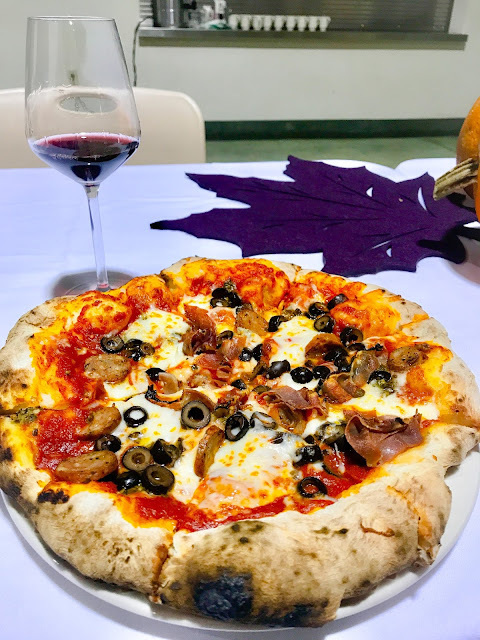 The overwhelming majority of wineries are fully up and running and what they, as well as the rest of the businesses in the area, really need is customers to come back and support them. 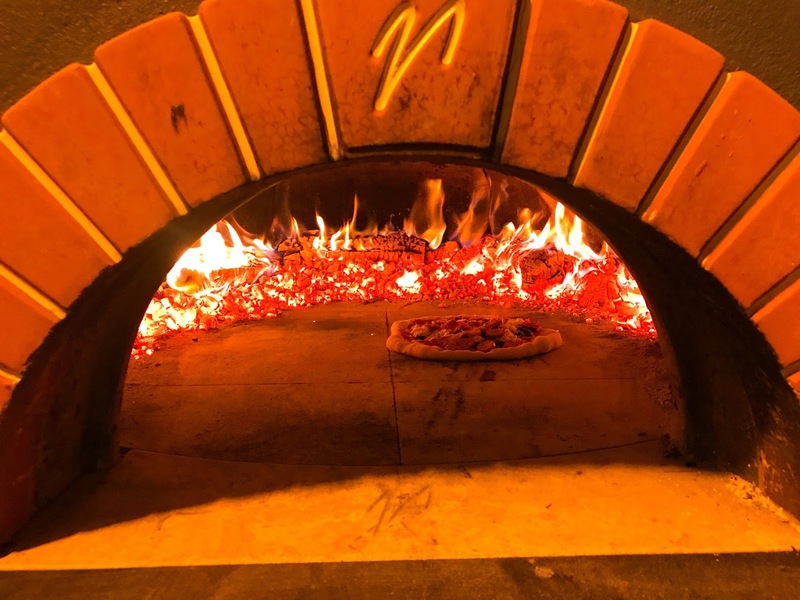 The fires hit right in the middle of the heaviest tourist season of the year, which these businesses all really rely on for income on even an average year. Support will be even more important in this recovery period. 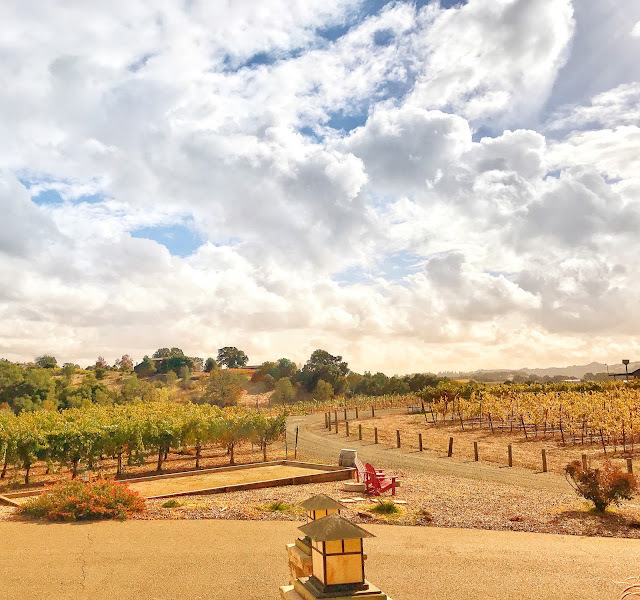 So go visit and drink Sonoma and Napa–they’re eager to see you!